While I am here in the US for a longer period this time, I thought of visiting some place during the weekend. I caught with long time friends whom I have not met much after they moved to US, but have been in touch regularly over the net. Ravi and Raghu have been my friends for more than 10 years and are now settled in the US. We decided to plan a one day trip to some place, since both had to be in work on Saturday. 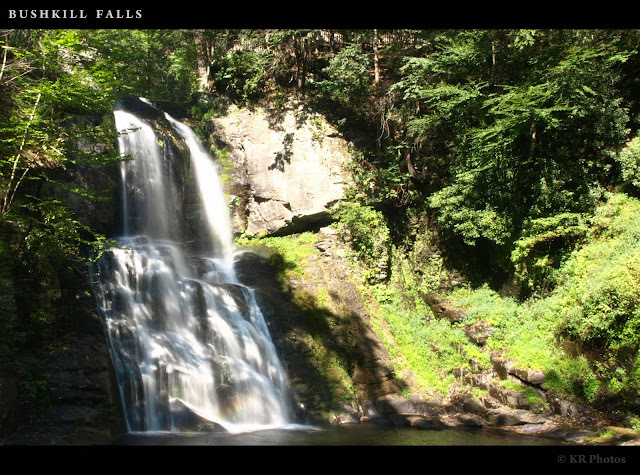 After some digging in the net and checking with friends by everyone, we decided that we will visit Bushkill Falls in PA, which is about 80 miles from North Brunswick. All of us came to Ravi’s place on Saturday evening and decided to start from here the next morning. We had plans to ride in Ravi's new mini van which he had bought only last week. Since both Ravi and Raghu have kids of age 2.5 and 1.5, it is not going to be easy to start early. 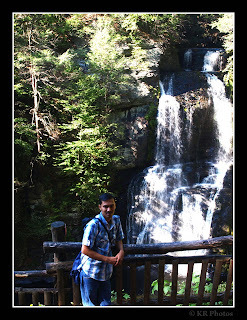 So the plan was to start from home by around 10:00am on Sunday morning and reach Bushkill falls by around 12:00 noon. Explore the place, do some trekking (this was given in the information page of Bushkill falls) and return back. As per the information in the site there was also kid’s play area. So we had planned to leave the kid’s with their (poor) mother’s and we 3 had thought of exploring the place. The next morning when we started it was about 10:30 am (not bad at all, considering getting the kid’s ready). The weather was just perfect. Sunny and no signs of any rain. We drove up to the Burger King in Morristown near Brunswick had a late breakfast and proceeded on to Bushkill falls. 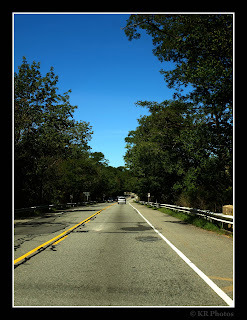 Though we started a bit later than the scheduled time, we caught up pace owing to the very minimal traffic and reached Bushkill Falls by around 12:00 noon. Once there were got a map from the information centre there and came to know that there were 4 different routes one can explore depending on the fitness level of the person. The Green route was the easiest which takes you to the main falls. One can get a good view of the falls here and return back. The Red route was the most difficult and covered about 2.5 miles. There were warning information in the maps and throughout the entire area that only fit and regular hikers should take this route, since the route is quite steep and goes across lots of boulders and streams. Since the kids were quite very enthusiastic and energetic, we realized that the two kids cannot be taken care alone by their moms and decided that Ravi would stay back with them for a while, take them to the kid’s play area and once they are comfortable playing there with just their moms, he would return back to join me and Raghu. Having decided that, I and Raghu started walking in the route marked as Red, hoping to get a good trek or hike. It was already about 1:00pm when we started the walk. The map showed 4 streams and small falls – the Pennell Falls, Bride’s Veil Falls, Bride’s Maid Falls and finally over to the Main Falls (this Main Falls also can be accessed through the short Green Route). There also was a sign that except the Main Falls the others may not have water during draught period. Since this was no draught and we had good rains for 3 days last week, we thought we were going to have a visual treat all along. 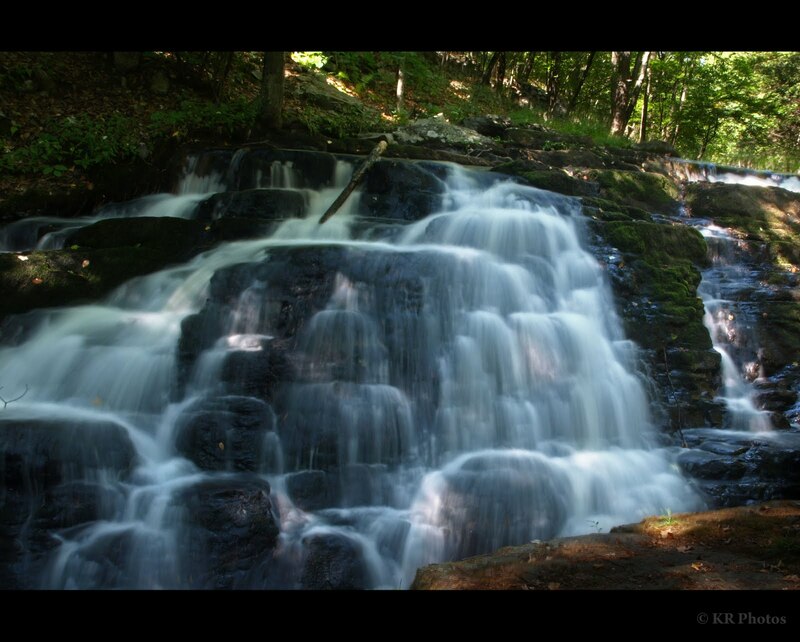 The first falls we encountered was the Pennell Falls in the Red Trail. There was some water, in the falls, though not gushing in full force, it did have decent amount of water to call it a falls. I took some photographs there and proceeded on the Trail. There was a point called the Peter’s Corner. From here we can proceed straight in the trail or take a deviation to the other falls. We took the deviation and decided to check the falls. The next ones were the Bridedmaid’s Falls and the Bride’s Veil Falls which were dry and did not a trickle of water. This was a huge disappointment for me. The place was quite scenic and would have given a wonderful view had there been some water. We proceeded went back to Peter’s corner and proceeded on to the Main Falls. This one had good amount of water, more than what was there in the Pennell Falls, but still nothing to my liking or nothing like what I have seen in South India. Took some photographs here as well and proceeded and reached the top of Main Falls. There weren’t any good views here so proceeded on further in the trail and reached the exit. While were reached the exit, Raghu’s wife and Ravi’s wife were in the snacks centre getting some drinks for the kid’s. They were surprised to see us back within one hour as the map had indicated at least 2.5 hours. We explained that the route was not even half difficult as what was mentioned and there was some amount of water only in the Main Falls. They too had returned from the play area and had visited the Main Falls from the top of it and had returned back. Ravi in the meantime had come in the Red Trail thinking he can catch up with us somewhere on the way. We waited in the picnic area for about 30 minutes for Ravi to return. Once he was back, we once again went to the kid’s play area let the kids play for sometime and headed back home. On the way we ordered and packed some Indian food and had our dinner at Ravi’s place. That was the end of the day. Though the place was nice for a day’s getaway, the way it has been marketed seemed too much exaggerated, from my point of view. Out of the 4 falls, I would have expected at least one falls to have had real gushing water to call it a falls. The next disappointed was the hiking or trekking part. The trail certainly did not live up to the hype it has been given. Even for a very moderate trekker like me, it was just a walk in the park and by no means would I call it a trekking or hiking! Thirdly the place had nothing to be called “Niagara of Pennsylvania. If one is lead to believe this something like Niagara, I am sure most visitors from other countries would either lose any love for the wonderful Niagara or never recommend Bushkill as a tourism place. My expectations may have been higher by what I used to see back in India as a falls, or by the information that have been given in the websites, but I would suggest anyone who wishes to go there, to go with the expectation of a weekend getaway and not to see a replica of Niagara!